When Mandy Murray found out she needed a new kidney her husband Graham volunteered to be a donor but was told he was not a match. Instead the couple became part of a kidney swap chain, which is allowing more people to find live donors. Mandy first needed a kidney transplant about 19 years ago. Because her husband was not compatible, Mandy had to wait until a suitable donation became available from a deceased donor. She considers herself lucky to have got a phone call in the middle of the night and been rushed to hospital to receive the donor kidney. Many people are not so fortunate. Last year, 26 people in Scotland died while waiting for a kidney transplant. When a person needs a new kidney they first turn to family and friends to find a living donor. Doctors says patients who have a living kidney transplant tend to live longer and feel better than those who receive kidneys from a deceased donor. Mandy’s new kidney allowed her to function for 18 years but it has recently started to decline and she was told she would need another transplant. Her husband Graham was tested again but was still not a match. However, Mandy’s consultant told her about the UK Living Kidney Sharing Scheme, which has been running for more than a decade. “It is where couples like us can be paired up and help each other out,” says Mandy. “My brilliant husband didn’t hesitate for a moment. The kidney sharing scheme uses an algorithm designed at Glasgow University. It goes through everyone who has volunteered and tries to find better matches and maximise the number of possible transplants. The computer programme is run four times a year and the transplants are then scheduled by a dedicated coordinator. It is a logistical challenge, according to Sarah Lundie, the coordinator at Edinburgh’s Royal Infirmary. In order for even the simplest kidney swap to go ahead you need two healthy donors and two recipients who are also not suffering from any illnesses. If any one of them gets so much as a cold, the whole carefully arranged schedule must be cancelled. Ms Lundie must also make sure that there are operating theatres booked at both locations and four surgeons must be available to carry out the procedures, not to mention their extensive back-up teams. There is also a great deal of liaison going on to ensure that the organs are transported from the donors to the recipients at the same time. 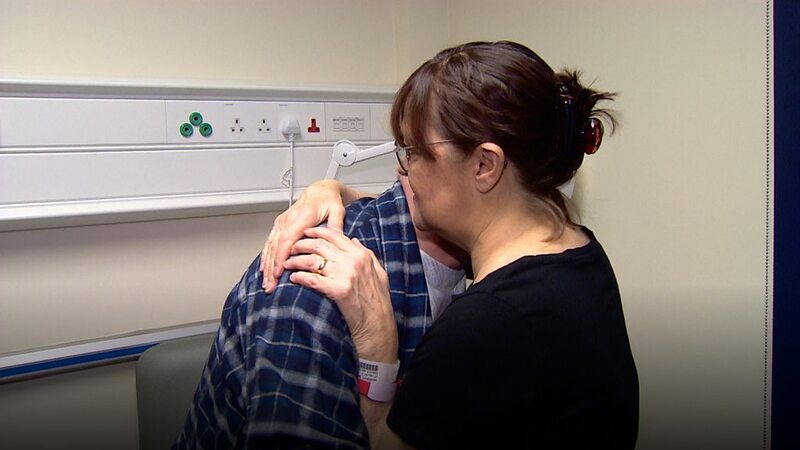 As he sat in Edinburgh waiting to donate his kidney, Graham Murray, 53, was aware that there was someone in Belfast, who must remain anonymous, waiting to give up a kidney so that it could be donated to Mandy. His wife Mandy, 57, says they have felt the “responsibility” of keeping well in the weeks before the operations so that the donor sharing chain would not be broken. Graham and his counterpart in Belfast are the first part of the surgical equation. Both donor kidneys are removed simultaneously in the two locations. In Edinburgh, consultant transplant surgeon John Terrace scrubs up for an operation he says usually takes about three hours. “I’m thinking about the donor rather than the recipient,” he says. Mr Terrace says he uses a modified form of keyhole surgery to remove the kidney. He uses laparoscopy to see but also has his hand inside the patient. “That offers an extra element of control and safety,” Mr Terrace says. He says these are then prepared so the kidney can be removed quickly but still be suitable for “reimplantation” into the recipient. Once the kidney is removed it is quickly on its way. In this case, the organs leave Edinburgh and Belfast on chartered flights, arriving in time for the donation surgery to happen in the afternoon. Mandy’s kidney surgery is performed by consultant Sorina Cornateanu. She uses blood vessels going to the leg to help attach the new kidney. Then the blood supply is returned and the kidney turns pink and perfused. Often the kidney passes urine on the operating table. The surgery takes about three hours and the patient is immediately started on anti-rejection drugs and goes into a high-dependency unit. After successfully operating on Mandy, Ms Cornateanu describes her team as the “vehicles” between the donor and the recipient. Ms Cornateanu said the shared donor scheme had been a big success and even in the past year the number of live donor transplants had risen in Edinburgh by half to 14. Across Scotland, 50 kidney sharing scheme transplants have taken place in the past five years. It is more common for living donor transplants to involve a relative or friend who is a close match but this is not always possible. Another form of living donation is “altruistic”. Over the past 10 years, 78 people in Scotland have donated a kidney to a stranger. The day after their operations, Mandy and Graham were told the other donor and recipient in the chain were doing well. “I’m so pleased,” said Mandy. The pair hope they will soon be recovered enough to fulfil all the plans they have had to put on hold until now.